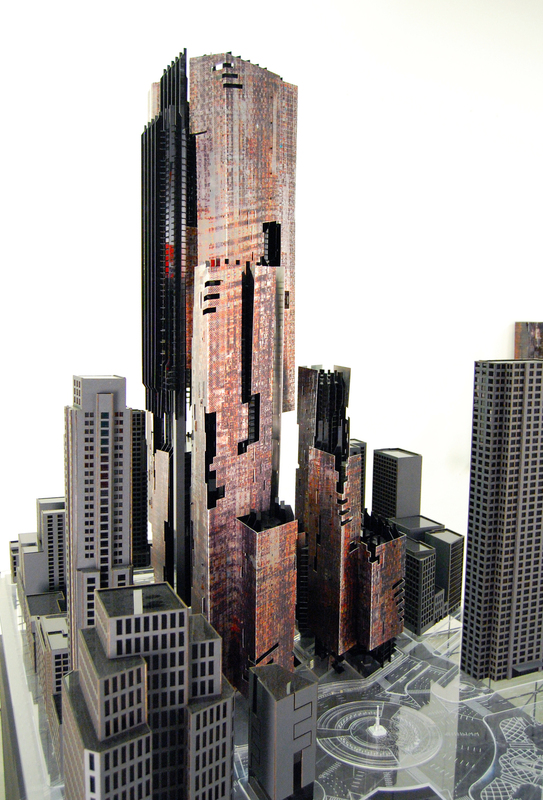 The model was built from an assortment of materials utilizing a variety of custom fabrication techniques. The MDF box was CNC milled to accommodate the custom steel “foundation” to be fastened discretely within the base. 1/4” clear acrylic was then laser cut to highlight the site plan of Columbus Circle illustrating Central Park adjacent to the circle. The surrounding context buildings were built from 1/8” black acrylic and clad with laser cut illustration board veneer. The three towers that comprise our design concept were built from 1/8” black acrylic supported by variable powder-coated aluminum tube reinforced within the model box. After numerous test prints, the featured cladding on the three buildings was laser cut from 4’x8’ aluminum sheet metal and outsourced to Warner Bro’s where it received its graphic pattern on their large format ultra-violet plotter. Over the course of the project, we developed a catalogue of perceptual devices derived from a series of analytical models and drawings. The models began with an interest in developing a complex field and breaking it into its constituent parts. Masking, expanding, and highlighting the edge became techniques that proved useful at both subverting or confounding a range of perceptual readings: from clear volumetric legibility, to a feathered edge, to the complete erasure of volume all together.